Air Conditioning isnt just for Offices and commercial buildings. Many homes can benefit from home Air Conditioning and we have installed in many domestic houses with very satisfied customers. 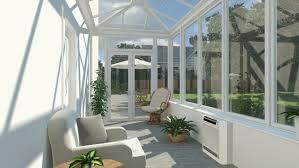 Conservatories are the perfect room for a home Air Conditioning system. It’s the one room where the temperature is never right – too hot in the summer and too cold in the winter. Air conditioning could transform your conservatory into a room you can use year-round. Offering both heating and cooling you could set your unit to a nice even 20 degrees and the system will do the rest. Our customers who have made the decision to get home Air Conditioning installed in their conservatory have all said they can’t believe they didn’t do it sooner. It also offers the added benefit of being able to keep your windows closed and enjoy the peace without listening to nextdoor’s lawnmower or chasing a wasp out of the room! Call us today for a free no obligation visit to discuss your home Air Conditioning needs and you could transform your conservatory, lounge or bedroom for less than you think. Trust EuroCool to provide you a quality home installation. 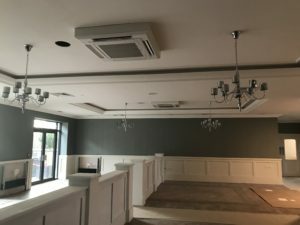 Why have Air Conditioning installed? To keep your environment at a comfortable level through all seasons so you never feel too hot or too cold. Air Conditioning units are dual function and offer heating as well as cooling. Most new units have an auto change-over switch so the unit will cool or heat as required. Keeping the air pure is another benefit as most modern units are fitted with an anti-fungus filter to catch allergy causing mites and odours keeping the environment clean and like fresh air. Air is recirculated via filters in the Air Conditioning system to trap dust and pollens which in turn helps benefit people with allergies and respiratory problems. Transform rooms like your conservatory into a fully functional part of your home that can be used all year round. In the hot summer months which are experiencing more often in the UK; Imagine the bliss of returning home to a lovey bright but cool conservatory. A welcoming place from the sticky heat we get in the UK. A good modern eco-friendly Air Conditioning unit will always do the job.